We’re all going to go crazy, living this epidemic every minute, while the rest of the world goes on out there, all around us, as if nothing is happening, going on with their own lives and not knowing what it’s like, what we’re going through. 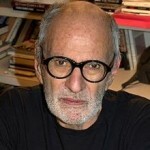 Larry Kramer is an American playwright, author, public health advocate, and LGBT rights activist. He began his career rewriting scripts while working for Columbia Pictures, which led him to London where he worked with United Artists. There he wrote the screenplay for Women in Love in 1969, earning an Academy Award nomination for his work. Kramer introduced a controversial and confrontational style in his 1978 novel Faggots. The book earned mixed reviews but emphatic denunciations from elements within the gay community for his one-sided portrayal of shallow, promiscuous gay relationships in the 1970s.